This week something incredibly important is happening in Vienna. The Government of Austria and UNOCHA have invited some states, international organizations and civil society to a two day meeting aimed at addressing harm from the use of explosive weapons in populated areas. Our colleagues at the International Network on Explosive Weapons have the details in the Network's most recent bulletin and press release. Although Mines Action Canada couldn't be in Vienna, we have released a new paper to contribute to the discussion. Our paper Hidden Victims: Additional Humanitarian Consequences of Explosive Weapons Use explores the less obvious humanitarian impacts of explosive weapons used in populated areas. We go beyond the initial casualty count to look for long term humanitarian harm. After Hungary closed its border to refugees, there have been reports that refugees are starting to seek a new route to safety through Croatia. After escaping cluster munitions, barrel bombs, shelling, suicide bombings and long term conflict, minefields left over from the 1990s threaten the refugees. 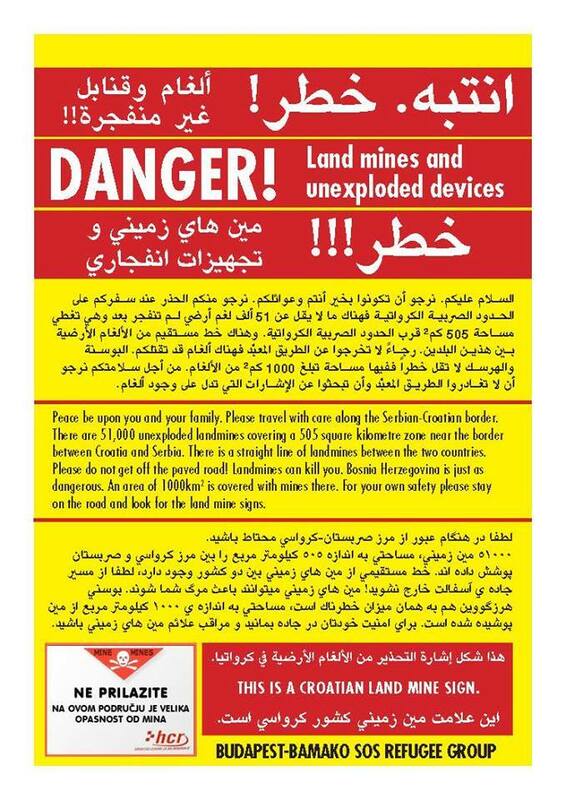 Before we talk more about this issue, some landmine safety notes for anyone travelling through Croatia (Google translated into Arabic). - Visit the Croatian Mine Action Centre map website to see where minefields could be located (زيارة الموقع مركز للأعمال المتعلقة بالألغام الكرواتي لنرى أين يمكن أن تقع حقول الألغام): https://misportal.hcr.hr/HCRweb/faces/simple/Map.jspx. - Learn more about the landmine situation in Croatia (تعلم المزيد عن حالة الألغام الأرضية في كرواتيا): http://www.hcr.hr/en/minSituac.asp and the Landmine Monitor. Croatia is not the only place where landmines threaten refugees as they attempt to find safety. To make things easier, we will focus on the impact of landmines, cluster munitions and other explosive remnants of war (ERW) on Syrian refugees but the Landmine Monitor has a factsheet on landmines/ERW, refugees and displacement that covers the issue globally. The border between Turkey and Syria has large minefields which have caused numerous casualties among those fleeing Syria. There are reports of displaced persons living in the minefield between Turkey and Syria. Refugees in Iraq and Lebanon face threats from landmine and ERW as well. Recently, we have heard reports of Syrian refugees being killed and injured by cluster munitions in Lebanon. While solving some of the conflicts that are driving the current refugee crisis may be slow and incredibly difficult, we can make the road to safety much more secure. A priority must be to fund mine clearance along borders and near refugee camps and settlements. Today Croatia started moving mine clearance teams to the borders to help prevent casualties. Funding this sort of emergency clearance operations is something Canada should be doing - it is an effective way of saving lives and helping live up to our obligations under the Ottawa Treaty banning landmines. No one should risk death or disability as they seek safety. In addition, emergency risk education is ongoing among refugee communities but it could be scaled up dramatically with increased funding. There is no debate that clearing minefields can save the lives of refugees now and into the future. It must be a priority. Map from the Croatian Mine Action Centre of mine fields near the Serbian border. A version of this post was published in the Times Colonist on 14 August 2015, available online here. On the 70th anniversary of the atomic bombing of Nagasaki, Victoria's The Times Colonist, published a decades old secret. Rudi Hoenson, a leading philanthropist in Victoria, had been a 22 year old Dutch prisoner of war in Nagasaki the day the bomb fell. You can read the whole story here. Mr. Hoenson had never shared his story publicly before. "Ask him why he has never talked about it before, he squirms a little, grimaces. Maybe he didn’t want to sound like he was showing off, he says. He is, in truth, reluctant to tell his story now, wants to know what good will be done by telling the tale." As someone born and raised in Victoria, I was incredibly surprised to read this article; I never considered that the Government House Team Room's elderly Dutch namesake could be a hibakusha. As a disarmament campaigner, I was saddened to read that Mr. Hoenson questioned what good sharing his story would do. Working on campaigns to ban landmines, cluster munitions and nuclear weapons has shown me quite clearly that there is incredible power in survivors of indiscriminate weapons sharing their stories. So to answer the question about what good telling your story now will do, Mr. Hoenson, your story has the power to change policy and sharing it this year is incredibly important. Every year since 1945, the world has said “never again” and every year since 1945 nuclear weapons continue to threaten all life on earth. Generations of school children have folded paper cranes while the survivors have shared their painful memories of the horror inflicted upon them and their cities. In response, leaders read statements of sorrow and vowed to pursue disarmament. Mere days later, the memories of the memorial event fade and the vows are forgotten until the next year when it is time to say “never again” again. In the meantime, 16000 nuclear weapons continue to threaten all of us and risk catastrophic climate change. With that state of affairs, anyone could be forgiven for wondering what good another survivor story could do. For the first time in decades, a world wide effort to ban nuclear weapons is gathering momentum. There have been three highly successful conferences on the humanitarian impact of nuclear weapons where states gathered with academics, civil society organizations, the Red Cross and UN agencies to examine the risks and probable results of another nuclear weapon detonation either by design or by accident. These conferences have challenged the sanitized and passive understanding of what happened to Hiroshima and Nagasaki that has taken hold. The actual horror of these weapons has been put aside for too many years. Testimony from survivors of Hiroshima, Nagasaki and nuclear weapons tests have been crucial to challenging that sterile discussion of nuclear weapons. Mr. Hoenson’s story provides evidence to back up the consensus among experts that the humanitarian consequences of a nuclear weapon detonation would be catastrophic and no state or humanitarian organization is capable of providing assistance to the victims. Survivor testimony and expert analysis has led many to the conclusion that nuclear weapons must be prohibited and eliminated. Based on these findings, the Government of Austria issued the Humanitarian Pledge calling on states to “fill the legal gap for the prohibition and elimination of nuclear weapons” in December 2014 (remember nuclear weapons are the only weapon of mass destruction not yet banned). The Humanitarian Pledge has been endorsed by 113 states and that number is growing. These states are supported by the International Committee of the Red Cross’ call to prohibit and eliminate nuclear weapons and the actions of the over 300 organizations making up the International Campaign to Abolish Nuclear Weapons. We, as a global community, now have the opportunity to take concrete action and turn our annual vows of “never again” into permanent reality. Shamefully, Canada is not on board with this world-wide effort to ban nuclear weapons. At the United Nations, our government objects to language in statements that says “It is in the interest of the very survival of humanity that nuclear weapons are never used again, under any circumstances.” Furthermore, our government has not endorsed the Humanitarian Pledge despite treaty obligations to pursue nuclear disarmament and a unanimous parliamentary motion calling for Canada to take a leadership role these efforts. Our government is squandering this opportunity to take concrete action towards nuclear disarmament. Maybe Canadians have been quiet on this issue because Hiroshima and Nagasaki happened long ago to unknown people far away. But upon reading Mr. Hoenson’s story of horror and of survival, we know exactly what that nuclear bomb did to one of our own. Now that we know, how can we sit by while 16,000 nuclear weapons remain around the world? Now that we know, how can we not ask our government to be a leader? Now that we know, how can we not act? Erin Hunt is the Program Coordinator at Mines Action Canada. Mines Action Canada’s 70 quotes in 70 days counted down to the 70th anniversary of the bombing of Hiroshima on August 6th. These 70 quotes came from around the world and all highlighted the need for nuclear disarmament. You can see all the quotes online here. The final quote on August 6th came from a member of the crew who dropped the nuclear bomb on Hiroshima. This quote was chosen to be the final quote for a very specific reason. Over the past 70 years a very sanitized and passive understanding of what happened to Hiroshima and Nagasaki has taken hold. “Hiroshima was destroyed.” “Nagasaki was bombed.” “Thousands of people were killed.” It almost sounds as though the bombings were an unavoidable or freak occurrence akin to a tornado or an earthquake not a conscious decision made by humans. So let us be clear, humans chose to use nuclear weapons on the men, women and children of Hiroshima and Nagasaki. It was a human decision. Once we recognize that the use of nuclear weapons was a human decision, we realize that as long as nuclear weapons continue to exist the decision to use them could easily be made again. Even more frightening is the possibility of unintentional use; human error or technical malfunction could result in catastrophe. The only way to ensure that no human ever makes the decision to use nuclear weapons again and no error results in their use is to negotiate a new treaty prohibiting the use, production, and stockpiling of nuclear weapons and then eliminate them. Nuclear weapons are a human invention, their use 70 years ago was a human decision and human action can ban them now. 70 years is enough. The Humanitarian Initiative on nuclear disarmament has shaken the status quo to its core. Like landmines and cluster munitions, discussing the humanitarian impact of nuclear weapons has opened new areas of discussion, new space for action and new possible avenues towards abolition. One of the new areas of discussion is victim rights and victim assistance. While there is a long history of supporting victim assistance in other humanitarian disarmament forums, the discussion of victim rights and assistance in regards to nuclear weapons has just begun. The concepts surrounding victim assistance are not well known in the nuclear disarmament community and wider public. Victim assistance puts the humanitarian front and centre in the humanitarian approach to nuclear weapons and yet there has been some confusion and debate about what victim rights mean and what their inclusion in nuclear disarmament could offer to abolition efforts. Based on experience with victim assistance under the Ottawa Treaty and the Convention on Cluster Munitions, we are launching a series of memos exploring the idea of victim assistance in disarmament and what this topic can offer to nuclear disarmament. Memo #1 - A Humanitarian Approach to Nuclear Disarmament: Victim Rights and Assistance provides a brief overview of the victim assistance and victim rights to set a foundation for the upcoming memos. Download the memo here and stay tuned for memo #2. On September 1, 2015, Canada will become legally bound by the Convention on Cluster Munitions (CCM). This international treaty bans the use, production, and stockpiling of cluster munitions. These deadly weapons scatter explosives over areas several football fields in size, killing indiscriminately. Current data suggests that as many as 94% of the victims of cluster munitions are civilians. Once conflict ends, unexploded cluster munitions continue taking victims, contaminating cities, fields, and forests as lethal reminders of the past. Cluster munitions often resemble toys, balls or soft drink cans, and thereby disproportionately affect children, who are often unaware of the danger. Canada’s ratification of the CCM in March was encouraging news. With the passage of Bill C-6, Canadian law now forbids aiding or abetting the use or production of cluster munitions. Canadian Members of Parliament, Senators and officials have stated that investment is included under this prohibition, but the legislation does not explicitly mention investment. This omission has led to confusion among Canadian financial institutions, and uncertainty about legal obligations. In its November 2014 report, Worldwide Investments in Cluster Munitions, Dutch peace organization PAX called out two major Canadian financial institutions for investing in cluster munition producers, and if you are one of the millions of clients of either of these firms, your investment might be supporting the production of cluster munitions. Despite the passage of Bill C-6, it is difficult to know if these investments have continued. This problem partly stems from a lack of clarity and consistency within the banking industry. While many Canadian financial institutions are good corporate citizens in most of their business practices, their policies on socially responsible investing do not extend to all their activities. Large financial institutions often have independent governance structures for each part of their business. Consequently, even a good faith statement by a bank to refrain from supporting or financing transactions related to cluster munitions might not apply to practices such as investment banking or asset management. These corporate governance structures often leave sizable gaps in responsible investment policies, thereby failing to fully eliminate suspect investments. When these inconsistencies are noted, firms should promise to review their weapons investment policies in a prompt and transparent manner. These promises should use clear timelines and corporate oversight to ensure that firms can both keep themselves accountable and publicly demonstrate their progress. It’s not all bad news though. Many Canadian financial institutions are making significant efforts to fully account for the social and humanitarian impacts of their investments. Canada’s second annual Responsible Investment Week starts today and runs to June 5th. It is dedicated to increasing education and awareness about responsible investment. Some financial institutions have already responded decisively to concerns about cluster munitions investing. NEI Investments and Desjardins Investments have been particularly proactive, leading the way in socially responsible investing on many fronts. In February, they announced a joint ban on investment in cluster munitions producers that extends to all their products and should be considered a model for all Canadian financial institutions. Actions such as these make it clear that corporate social responsibility should extend beyond community involvement, governance and environmental sustainability. Making the world a safe place for all to live, work and play will pay immediate social dividends. It is important that these hidden dividends are not overlooked. Instead of merely conforming to the lowest legal denominator, financial institutions can and should be on the leading edge of social change both at home and around the world. If you’d like to get involved, please contact your financial institutions and ask them to clearly state their policy on cluster munitions investment. For more information on disinvestment from cluster munitions, please contact Mines Action Canada at info@minesactioncanada.org or visit www.stopexplosiveinvestments.org. After graduating from Calvin College in Grand Rapids, Michigan, Andrew Luth spent two years living and working in China. He is currently pursuing his master’s degree at Carleton University’s Norman Paterson School of International Affairs in Ottawa, Canada. His academic interests include disarmament, conflict analysis and resolution, and the Asia-Pacific region. Over the past three years that I have been working full-time at Mines Action Canada in the field we like to call humanitarian disarmament, I have been struck by the results achieved by my colleagues around the world. Working with like-minded states, humanitarian disarmament campaigners are reframing conversations about weapons to focus on humanity and to build a safer, more peaceful future for us all. When people say that taking a humanitarian approach to disarmament is weaker than looking at state security and is idealistic compared to a real examination of power, they are missing out on much of the story. Putting humans at the centre of disarmament has shaped international law and state practice for years now and it continues to do so. Humanitarian disarmament campaigners get things done even when no one is looking. Starting in mid-2013, humanitarian disarmament campaigners in the Campaign to Stop Killer Robots began to call for meaningful human control over the use of force. Publications, media interviews and statements encouraging states to ensure meaningful human control emerged from campaigners around the world. At the first informal meeting of experts on the topic at the Convention on Conventional Weapons in May 2014, meaningful human control appeared a few times in the debate alongside other issues. Campaigners continued to push the issue forward and strove to deepen the discussion about meaningful human control nationally and internationally. Less than a year later at the April 2015, we saw a shift in the discussion – meaningful human control was called for and mentioned by numerous state delegations. Meaningful human control featured in the food for thought paper distributed by the German chair of the meeting and in working papers submitted by other states. The concept was mentioned during discussion in almost all sessions during the week. As the Campaign to Stop Killer Robots end of meeting summary put it: “The need for meaningful or adequate or another form of “human control” has been central to the debate with the majority of states speaking in support of retaining it.” Some proponents of autonomous weapons systems have implied the topic is complex and technical however in less than two years, humanitarian disarmament campaigners have successfully framed the debate around concepts everyone can understand – human control and humanity. The concept of humanity and obligations to protect civilians put forward by disarmament campaigners are also that the root of two recent policy changes by the United States. First, in September 2014, the United States released a new policy regarding anti-personnel landmines after years of campaigning by Americans and the International Campaign to Ban Landmines. The new policy is slightly weaker than hoped as it bans landmines everywhere in the world but the Korean peninsula; however, this policy aims to bring the United States into “closer alignment with a global humanitarian movement that has had a demonstrated positive impact in reducing civilian casualties from [anti-personnel landmines].” Even so, the humanitarian argument, carefully researched and shared by campaigners, is winning out. Disarmament campaigning resulted in a second policy change in the United States within the past year; this time on depleted uranium weapons. In October 2014, a Pentagon spokesperson stated that depleted uranium could be used if needed during the ongoing military operation against ISIS. Following intensive campaigning citing humanitarian concerns about the weapons, the Pentagon reversed course just a few months later in March 2015 and clarified that “US and Coalition aircraft have not been, and will not be, using depleted uranium munitions in Iraq or Syria.” This about-face shows campaigners can help governments change policies to protect civilians even during military operations by framing a disarmament issue around humanitarian concerns. Even within the Nuclear Non-Proliferation Treaty (NPT), long a bastion of big talk about “real” security concerns and deterrence, we have seen the discussion shift towards a humanitarian approach. The 2010 NPT Review Conference outcome document included mention of the humanitarian consequences of nuclear weapons and since then campaigners have worked very hard to ensure the conversation deepened and spread. The International Campaign to Abolish Nuclear Weapons’ call for a treaty banning nuclear weapons based on their unacceptable humanitarian impact has gathered support from around the world. The International Committee of the Red Cross has called for the prohibition of nuclear weapons. There have been three widely attended international meetings on the humanitarian impact of nuclear weapons (Oslo, Nayarit and Vienna) and at the most recent meeting, Austria issued the Austrian Pledge vowing to fill the legal gap regarding nuclear weapons due to their humanitarian impact. An increasing number of states have endorsed the Austrian Pledge. A large number of states have embraced the humanitarian framing and issued joint statements about the humanitarian consequences of nuclear weapons at NPT and at First Committee of the UN General Assembly. The most recent humanitarian statement, as they are called, had 159 states signing on. For nuclear umbrella states that are uncomfortable with the idea of a ban on nuclear weapons, the shift towards a humanitarian discourse has been problematic. For the past two years, Australia has led a second humanitarian statement with weaker language (Canada signed this statement not the larger, stronger one). Even those who would like to maintain the status quo cannot escape the shift in language led by disarmament campaigners. Some people who do not follow the humanitarian discussion see this Australian statement at the NPT as evidence of a weakening of the humanitarian initiative. In reality, the Australian statement shows how far the nuclear weapons discussion has shifted and how strong the humanitarian initiative is – states on the outside need to adopt the language in an attempt to avoid political fallout. Humanitarian disarmament campaigners have changed the conversation and built impressive global momentum towards a ban on nuclear weapons all while being disregarded as idealists with an impossible dream by so-called ‘realists’. Reality is disarmament campaigners have a proven track record of using well-evidenced humanitarian arguments to change government positions and to create international laws and norms. From landmines and cluster munitions to the newer issues discussed above, humanitarian disarmament campaigners are getting results. Donors, governments and citizens who want to see real change in the world of peace and security should get behind the humanitarian disarmament movement. Humanitarian disarmament campaigners are not out of touch idealists. All our goals as a humanitarian disarmament community are possible however we have been framing the debate to make them not only probable but more realistic as well. A pre-emptive ban on autonomous weapons is much more realistic than waiting to see if there is some mythical benefit to humanity of delegating decisions about the use of force to robots. Ending the use of depleted uranium is much more realistic than refusing to even research the problem. A ban on nuclear weapons (even without the nuclear weapons states) is much more realistic than expecting a magical global security situation to materialize and “create conditions conducive to nuclear disarmament”. No one here is tilting at windmills; we are changing the disarmament conversation and changing policies nationally and internationally to build a safer, more peaceful world. While the extension and expansion of Canada’s mission against ISIL was debated in Parliament, Canada finally ratified a treaty that could save lives in the Syrian Arab Republic (Syria) for years to come. On March 16, Canada ratified the Convention on Cluster Munitions more than six years after signing the treaty. Cluster munitions are dropped from aircraft or fired from the ground or sea, opening up in mid-air to release tens or hundreds of submunitions, which can saturate an area up to the size of several football fields. The Convention on Cluster Munitions prohibits the use, production, transfer and stockpiling of these inhumane weapons due to the unacceptable harm they cause to civilians. The Syrian government continues to use cluster munitions against its own people with catastrophic results – over 1,000 casualties were reported in 2013 and the casualties continued throughout 2014 and into this year. While Canada’s ratification of the Convention on Cluster Munitions will not put an immediate end to the Syrian government’s use of this horrific weapon; Canada now has obligations to help lessen the suffering of Syrians injured by cluster munitions and to contribute to the prevention of future casualties. Under Article 21 of the Convention on Cluster Munitions, Canada has an obligation to discourage our allies in efforts against ISIL to not use cluster munitions. Article 21 is known as the universalization clause because it requires states parties like Canada to encourage allies to join the treaty and to discourage any use of cluster munitions by anyone. The Canadian government should do everything it can to ensure that none of the states in the anti-ISIL coalition use cluster munitions to prevent further casualties amongst the civilian population in Syria or Iraq. Canada also has obligations under the treaty to provide assistance to the victims of cluster munitions and to support risk education and the clearance of unexploded submunitions. The Government of Canada can immediately begin to support Syrians who have been injured by these horrific weapons. Support to trauma and medical services in Syria, to medical and rehabilitation services for refugees in neighbouring countries and to disability programs in the region will have an immediate impact on the lives of cluster munition survivors, their families and their communities. All of these actions will help Canada meet the victim assistance obligations under the Convention on Cluster Munitions and will improve the lives of Syrians. The government can also support risk education operations in displaced communities to help prevent casualties when people return home to areas now contaminated by unexploded submunitions. The ongoing conflict means that clearance of unexploded submunitions cannot yet start but it is possible to educate people about the risks and to begin to gather information about dangerous areas to allow for a quick response as soon as it is safe to enter the country. Canada can begin to plan for such life-saving actions by creating a rapid response fund and by supporting organizations that are doing surveys on the situation in Syria in preparation for clearance operations. Over 98% of cluster munition casualties in Syria have been civilians and countless more civilians will be at risk when they return home to areas contaminated by cluster munition remnants. Canada can act now to prevent future casualties through education and preparation for rapid response clearance. Parliament will continue to discuss the mission in Iraq and Syria as it unfolds and pundits will analyze and criticise that we are risking too much or not doing enough. Regardless of the extension and expansion of the military mission against ISIL, Canada has the opportunity to create meaningful change in the lives of the people who suffer the painful consequences of the Syrian government’s use of cluster munitions by fulfilling our obligations under the Convention on Cluster Munitions. It is time for Canada to be a leader on ending the suffering caused by cluster munitions and let us start by helping the people of Syria. The Smashing Pumpkins music video for "Drum+Fife" is visually stunning and powerful. It brings light to the fact that wars don't end just because the guns fall silent and a peace agreement is signed. Landmines, cluster munitions and other explosive remnants of war continue to kill and maim years or decades after conflict while those who fought often return home with visible and invisible injuries only to be forgotten. Since the video focuses on children passing through a mine field, let's look at the most recent statistics about landmine casualties. The Landmine Monitor 2014 has the most up to date information about the global landmine situation. In 2013, the Monitor reported 3,308 mine/ERW casualties of which 1,065 people were killed and another 2,218 people were injured. On average nine people are killed or injured by a landmine or other explosive remnants of war every day. Landmine casualties were reported in 55 states and other areas in 2013. There were 1,112 child casualties in 2013 or 46% of all casualties. The majority of child casualties were from three countries - Afghanistan, Colombia and Syria. Globally women made up 12% of all landmine casualties. 79% of casualties in 2013 were civilians while security forces made up 18% and 3% were deminers. While these figures are distressing they demonstrate a marked improvement compared to the situation before the Ottawa Treaty banning landmines. The Ottawa Treaty has led to an incredible decrease in the number of landmine casualties globally since it became international law in 1999 but there is still a long way to go. We need all states to join the Ottawa Treaty and commit to a mine free world. Learn more by visiting our website or www.the-monitor.org and support our work by donating online. Erin Hunt, Programme Coordinator, Mines Action Canada.